Welcome on the extended page with growing info. This page consists culture info (from top to bottom) of : The cristata cut flower series “Bombay” (“flat” combs) and “Neo” (“thick” combs), the spicata cut flower series “Celway” (needle form), the plumosa cut flower series “Sunday” (plume form), the cristata pot/bedding variety “Dracula” (combs), the spicata pot/bedding plant series “Kosmo” (needle form) and the plumosa pot/bedding plant series ”Ice Cream” and “First Flame” (plume form). *And below that – under the line – you can find information about fighting Striga, the devastating “witches weed”. We’ve done research how to control ( and reduce ) that parasite weed in tropical areas. Followed up by information about “Celosia as a food crop”. “Bombay” is a high-quality new greenhouse cut flower series with round stems, flat combs, new appealing colours and truly uniform growth. the transportability is much better (less waste thanks to the round stems). Good workability and less breakage by the stretched model of the flower with a not too thick curl in top. * Breakage is in handling and transportation in the supply chain a major annoyance! It also has a better stress resistance. Vase life of Celosia Bombay is approximately three weeks. 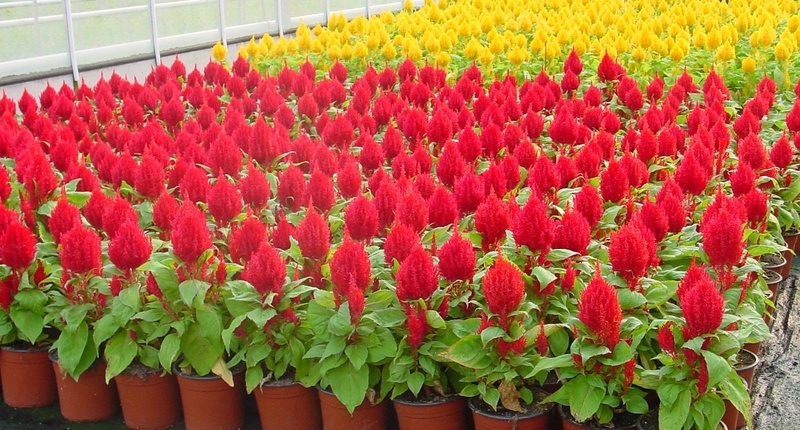 Celosia Bombay Series has been a breakthrough in Celosia breeding. The combination of unique and attractive flowershapes, together with uniformity and short croptime has been winning. All the “Fi” type are small leaved, can grow well under tropical circumstances, easily make good length ( also in the tropics ) and all react the same which facilitates production planning. method: Directseeded greenhouse culture: sow on the soil and press lightly. Keep soil constantly humid. 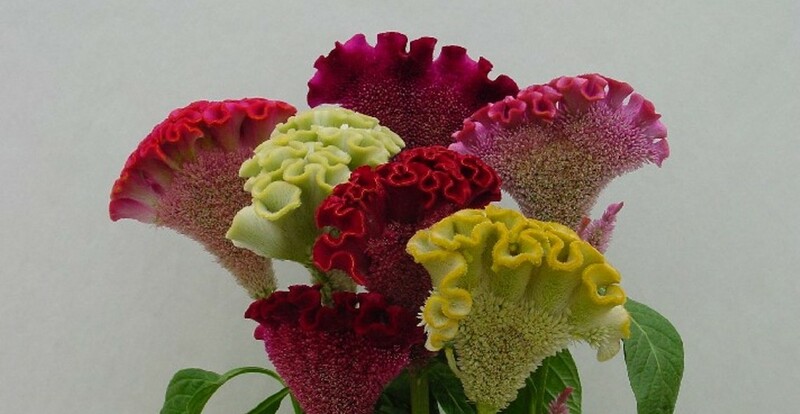 If Celosia suffers from water stress, it will produce a flower immediately, without reaching sufficient length. Do NOT pinch. Treat preventively against fungi ( for instance Rhizoctonia ). Transplanting/young plant production: sow 1 seed per plug. Cover lightly with vermiculite. ATTENTION: Celosia makes a taproot and is sensitive to root damage.Root damage results in too early bud formation and gives “off type” flowers and loss of uniformity. THEREFORE: plant out before the taproot comes out. This depends on time of year and plug type, but generally between 10-18 days after sowing. In this stage, mostly the first pair of true leaves unfolds. temperature: day 24-26°C ( 75-78°F ), night 22°C ( 71°F ). Rel. humidity 90-95%. seed quantity or plants per m² :directseeding: 80 pelleted seeds/m² ( =64 per m² with one extra in every other hole in the two outer rows on each side). When transplanting plugs : 64 plants/m². distance between rows and/or plants : 64-80 plants/m²; with 12,5 x 12,5 /5 x 5″ Chrys. netting for support. irrigation : overhead irrigation until flowers appear, preferably in the morning. Foliage should be dry at the end of the day. Before flowering: refrain from overhead irrigation in order to prevent fungi to develop; keep soil dryer, only irrigate when extremely sunny or when foliage wilts. Over-irrigating may cause flowers to become top-heavy and fall over. optimum temperature : growing climate (2-3 weeks after sowing):day 18-19°C ( 64-66°F ), night 17°C ( 62,5°F ). Flowering climate ( hardening off; 6-8 weeks after planting): day 16°C ( 61°F ), night 15°C ( 59°F ). diseases/pests : aphids, thrips, leaf miners, spider mites, caterpillars, Botrytis. After the seedling stage (after planting out) Bombay must immediately and regularly be treated preventively against aphids and thrips. A few thrips can do a lot of damage in the new born flower inside the young plants. Add some fluid sugar to the pesticide to attract the hidden thrips from the heart of the plant, max. 100 ml in 100 ltr. water. More detailed info available upon request at Pan American Seed ( from here in short “Pan Am Seed”), or contact your local seed / young plant supplier. fertilization : info available upon request at Pan Am Seed. relative humidity : high during germination, lower when flowering. Keep the air and the flowers dry when pollen appear to avoid Botrytis. Chemical growth regulation : if excessive length is expected, use Alar 64 (daminozide), from 30-50 cm /12-20″: 3 gr/ltr , weekly treatment, depending on weathertype. At near the desired endlength, plantheight can be practically halted using 5 gr/ltr. Growth regulation via daylength : short days will initiate flowering and therefore limit length and crop time. When daylenght longer than 13 hours, start with darkening. DON’T start till 1 week after germination. Provide dark period of minimum 12 hours for 4-5 weeks. During darkening, watch out for too high RH. Regulate climate through RH or preferably moisture deficit. Celosia is susceptible to salts/high EC’s. Celosia is very sensitive to climate changes. Shading is only required when light intensity is very high. Low light intensity, short days and too low temperatures may cause growth problems, i.e. flat stems and combs shattering. Therefore, do not sow later than end of June (Northwest Europe). The size of the flower depends on the plant density. DO NOT MAKE THE MISTAKE TO HARVEST TOO SOON. The stem needs to harden another 3-4 weeks from the moment the flower SEEMS mature and ready: the flower diameter should be approx. 10 cm / 4″ and the lower 5 cm / 2″ past flowering. “Bombay Firosa” needs extra watering shortly before the first flowers start to bloom on the side of the comb, to prevent that the flowers are discoloured at the moment of harvesting ! Spilt seeds from the flowers may be troublesome after sowing or planting following crops. Therefore it is advised to cultivate the soil very superficially, add a bit of water and raise the temperature. After 7-10 days the regrowth can be removed with a herbicide. The Bombay Series is bred for greenhouse cutflower production. Only in exceptional conditions outdoor culture is possible. In the end of growing the flowers must absolutely be kept dry. Please contact Pan Am Seed for more information and advice. Celosia cristata grp. “Bombay” series are protected by Plant Breeders’ Rights and/or Plant Patents. Therefore, only initial material supplied by the breeder and/or licence holder may be used for the cultivation and marketing of cutflowers of Bombay. The buyer shall only sell the end product under the name of “Bombay”. By no means initial material may be used for the propagation of initial material for own requirement and/or for the sale of seeds, plants, plant parts and flowers. Infringement of the plant breeders’ rights is punishable by law. In respect of the fulfillment of above stipulations the seller shall have the right to carry out an inspection to the buyer’s premises or the plots under his control at all times. 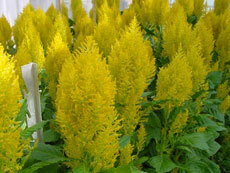 *Celosia “Bombay yellow-gold” and “- purple” have both been awarded with a Fleuroselect Gold Medal. The name Celex – Bombay® is a registered trademark. This information is based on West European conditions and is given for general guidance only. No guarantee is given for the result of the crop, nor is liability accepted for the consequences of applying above indications. Celosia cristata grp. “Neo” series can be grown under the same climate and soil conditions as the “Bombay” series. See above. “Neo” can grow out in long days ( = day length > 13 hours ) and that has the advantage of a better climate in the greenhouse ( darkening screens open ! ) and the plant picking up all sun there is, resulting in top quality flowers. *Remark : It’s recommended to maintain a period 3 weeks shortened day ( < 13 hours daylength ) after planting when the daylength exceeds 13 hours, to improve uniformity. After that, when the plants make more body mass, need more sun and evaporate more, the rest of the crop time can be in – less humid – long day conditions. Celosia cristata grp. “Neo” series are protected by Plant Breeders’ Rights and/or Plant Patents. Therefore, only initial material supplied by the breeder and/or licence holder may be used for the cultivation and marketing of cutflowers of “Neo“. The buyer shall only sell the end product under the name of “Neo“. By no means initial material may be used for the propagation of initial material for own requirement and/or for the sale of seeds, plants, plant parts and flowers. Infringement of the plant breeders’ rights is punishable by law. In respect of the fulfillment of above stipulations the seller shall have the right to carry out an inspection to the buyer’s premises or the plots under his control at all times. 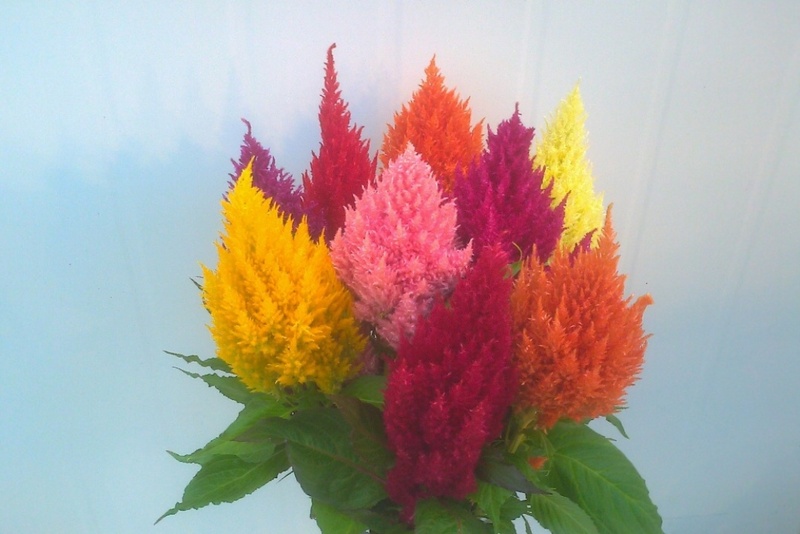 “Celway” is a new type of spicata in professional cutflower Celosia. The “flower” consists of one central “needle”, surrounded by several smaller “needles”. The total impression of the inflorescense is of a bunch of “needles” with extra side branches. The series has the advantages of small topleafs ( and because off that an excellent sleeve performance ), strong stems and a good vaselife. Cultivation speed is comparable to the “Bombay” series. absolute minimum to germinate well is 20°C / 68°F, below that germination % reduces much. seed quantity or plants per m² :directseeding: 80 pellets/m² ( =64 per m² with one extra in every other hole in the two outer rows on each side). diseases/pests : aphids, thrips, leaf miners, spider mites, caterpillars, Botrytis. After the seedling stage (after planting out) Celway must immediately and regularly be treated preventively against aphids and thrips. A few thrips can do a lot of damage in the new born flower inside the young plants. Add some fluid sugar to the pesticide to attract the hidden thrips from the heart of the plant, max. 100 ml in 100 ltr. water. More detailed info available upon request at Pan Am Seed ( or contact your local seed / young plant supplier ). Growth regulation via daylength : short days will initiate flowering and therefore limit length and crop time. When daylenght langer than 13 hours, start with darkening. Celosia is very sensitive to climate changes. Shading is only required when light intensity is very high. Low light intensity, short days and too low temperatures may cause growth problems, i.e. small flower(bunches). Therefore, do not sow later than end of June (Northwest Europe). The size of the flowerbunch depends on the plant density. The stem needs to harden another 2-3 weeks from the moment the flower SEEMS mature and ready: The actual flowers of the central “needle”must be open until 1/3 of the height. Flowering starts from below at the base on the stem. 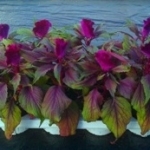 The Celway Series is bred for greenhouse cutflower production. Only in exceptional conditions outdoor culture is possible. In the end of growing the flowers must absolutely be kept dry. Celosia spicata grp. “Celway” series are protected by Plant Breeders’ Rights and/or Plant Patents. Therefore, only initial material supplied by the breeder and/or licence holder may be used for the cultivation and marketing of cut flowers of Celway. The buyer shall only sell the end product under the name of “Celway”. By no means initial material may be used for the propagation of initial material for own requirement and/or for the sale of seeds, plants, plant parts and flowers. Infringement of the plant breeders’ rights is punishable by law. In respect of the fulfillment of above stipulations the seller shall have the right to carry out an inspection to the buyer’s premises or the plots under his control at all times. The name Celway® is a registered trademark. The “Sunday” series is a new (plume) series for professional cutflower production, developed because most older plumes in cutflower production have a problem with shortage of stemlength.The “Sunday” varieties always have enough length, a nice full plume and are available in several intense colours. Cultivation takes approx. 1 to 2 weeks longer than the Bombay series. We’re still working on an expansion of the colour range. Sunday orange improved ( taller than the present -orange ) Introduction in 2017/18 ! Sunday bright pink Introduction in 2017/18 ! Sunday cherry Introduction in 2017/18 ! Sunday purple Introduction in 2017/18 ! method: Direct seeded greenhouse culture: sow on the soil and press lightly. Keep soil constantly humid. diseases/pests : aphids, thrips, leaf miners, spider mites, caterpillars, Botrytis. After the seedling stage (after planting out) Sunday must immediately and regularly be treated preventively against aphids and thrips. A few thrips can do a lot of damage in the new born flower inside the young plants. Add some fluid sugar to the pesticide to attract the hidden thrips from the heart of the plant, max. 100 ml in 100 ltr. water. More detailed info available upon request at Pan Am Seed ( or contact your local seed / young plant supplier ). Near flowering the plume needs to grow out another 3-4 weeks, the real flowers appear after the plume has completely been developed. Spilt seeds from Celosia flowers may be troublesome after sowing or planting following crops, but will happen occasionally in case of “Sunday”. To be sure it is advised to cultivate the soil very superficially, add a bit of water and raise the temperature. After 7-10 days the regrowth can be removed with a herbicide. The Sunday Series is bred for greenhouse cutflower production. Only in exceptional conditions outdoor culture is possible. In the end of growing the flowers must absolutely be kept dry. Celosia plumosa grp. “Sunday series” are protected by Plant Breeders’ Rights and/or Plant Patents. Therefore, only initial material supplied by the breeder and/or licence holder may be used for the cultivation and marketing of cut flowers of “Sunday”. The buyer shall only sell the end product under the name of “Sunday”. The name Sunday® is a registered trademark. Use a well-drained, disease-free media with a pH of 5.8 to 6.2 and a medium initial nutrient charge (EC 0.7 to 1.2 mS/cm). Sow 1 seed per cell in a 288 or larger plug tray. Cover seed lightly with vermiculite. Use a preventative treatment against soil-borne diseases. Celosia “Dracula” can respond to daylength at very early stage. Due to the negative effects of extreme short or long daylength (see photoperiod on growing on to finish), it is not recommended sowing seed at natural daylength shorter than 11 hours or longer than 15 hours unless using limited inductive photoperiod (LIP). A 3-4 weeks of 12 to 14 hours LIP treatment after sowing (during plug stage) will work well to speed up flower timing and reduce flower non-uniformity and deformation when produced in un-favorable daylengths. Stage 1 – Germination takes 2 to 4 days. Moisture: Keep soil moist (level 4) in stage 1. Humidity: Maintain 95 to 98% relative humidity (RH) until cotyledons emerge. Growth regulators: If necessary, Paclobutrazol (Bonzi, piccolo, piccolo 10x) 3 to 5ppm (0.75 to 1.25 ml/l, 0.4% formulation) spray at radicle emergence stage can be used for control early hypocotyle stretch. This treatment could delay flowering about 7 to 10 days. Optional PGR treatment see below stage 3 Growth regulators. Moisture: Maintain soil moisture at the same level (level 4); don’t allow the media to dry out. Fertilizer: Apply fertilizer at rate 1 (less than 100 ppm N/less than 0.7 mS/cm EC). Moisture: Maintain the moisture level constantly medium moist to medium wet (level 3 to 4). Don’t allow the media to dry out as water stress could cause premature flowering. Fertilizer: Apply fertilizer to rate 2 (100 to 175 ppm N/0.7 to 1.2 mS/cm EC). Growth regulators: it is no necessary if paclobutrazol has been sprayed at stage 1. If choosing optional PGR treatment, daminozide (B-Nine, Alar, dazide) can be used at early stage 3 with the rate at 1500 to 2500ppm spray. This treatment will be not as strong as paclobutrzol in control hypocotyl stretch but may not delay flowering timing. Moisture: Keep plug tray uniform moisture. Use a well-drained, disease-free, soilless media with a pH of 5.8 to 6.2 and an EC of 0.75 mmhos/cm in a well-balanced fertilizer. Maintain light levels as high as possible. Daily light integrate (DLI) of ≥12 mol. m-2.d-1. Celosia “Dracula” is a facultative intermediate-day plant. It will flower the fastest at daylength from 12 to 14 hours. Daylengths shorter than 11 hours or longer than 15 hours will significantly delay flowering. Daylength is also effect flower uniformity and form. Too short daylength (10 hours or shorter) will cause non uniform and deformed flowers. Too long daylength (16 hours or longer) will cause flower fasciate and leaves clustered close to top of the plant. Celosia “Dracula” can respond to daylength at very early stage. it is not recommended sowing seed at natural daylength shorter than 11 hours or longer than 15 hours (see above sowing timing). Celosia “Dracula” is a moderate feeder. Apply fertilizer at rate 2 (about 100 to 175 ppm N/0.7 to 1.2 mS/cm). Celosia is susceptible to high salt levels. It is responsive to daminozide (B-Nine, Alar) spray at about 5,000 ppm (5.9 g/l, 85% formulation or 7.8 g/l 64% formulation). If necessary, repeat the treatment. *Note: Crop time will be significantly increase when sowing seed at natural daylength shorter than 11 hours or longer than 15 hours (see above photoperiod section). Snails ! : Pay special attention to them, they’re fond of “Dracula” ! Especially beware of the small “naked” snails. Not only the young plants and leafs are damaged, but they also love the tiny flowers and pollen on the side of the comb. Next to the damage, the dried slimy traces – which remain afterwards on the flower – are also a problem. Treat preventive if there’s even a small chance of snails being present ! Compact bedding- and potplant with an impressive flowerhead. The flowerhead consists of a slender spicata headstem with at its base many side spikes. In high light conditions also cristata flowers can be formed during flowering. The total flowerhead sits on top on the well-proportioned leaves. The variety shows an excellent balance between flowerhead and leaves. This variety is suited for pack- and pot production and has a long lasting garden performance. *Kosmo Purple-Red ( the first in the series ) is a Fleuroselect “Approved Novelty”. irrigation : keep moist, no irrigation at the end of the day, to have plants dry at night. Produce at a stable level of moisture and adapt quickly to strong rising levels of evaporation. diseases/pests: standard in Celosia, i.e. Sciara, aphids, thrips, miner fly, snail, caterpillar and stemroot diseases. growth regulation : genetically compact, but if necessary use Alar 64 (daminozide). 2 gr/ltr in 2-3 treatments about 5-7 days apart. Start at young stage appr. 4-6 true leaves. Do not treat if flowerbuds are visible. day length reaction : Celosia is a short day plant. Keep Kosmo series optimally at a daylength of 12-13 hours for early flower induction, until flowerbuds are visible. 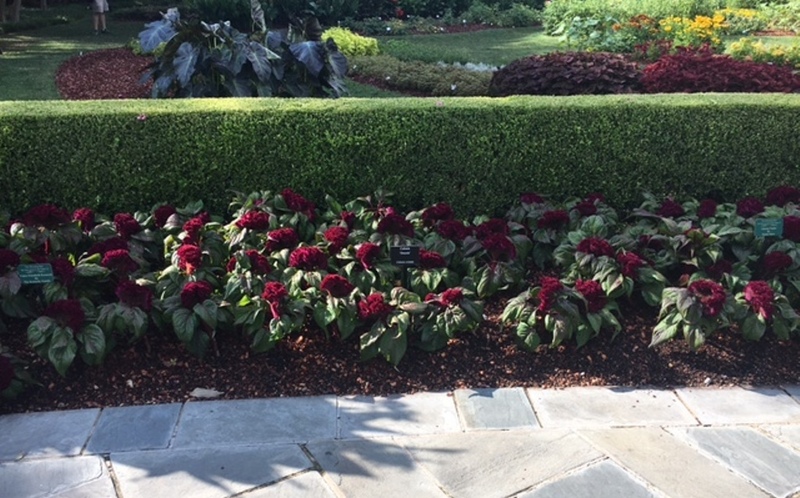 The Celosia “Kosmo” varieties are PBR-PVP applied. Salmon – Introduction 2016 ! An additional new colour is coming. “Ice cream” series are bred for strong impact. The compact habit (30 cm / 12″) and excellent basebranching plants in 6 strong colours with a large and tight flowerhead, make it a convincing container product that is very suitable for landscaping and packs. Icecream is outstanding in flower quality and has sales appeal as a finished product. The strong garden performance and heat tolerance are a solid guarantee for a long season of full colour. Please note the daylength reaction of Celosia plumosa and the schedule recommended. 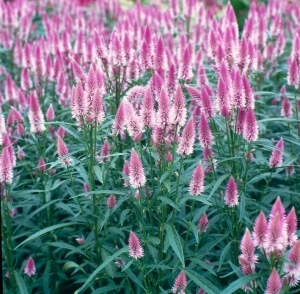 Icecream is the compact Celosia plumosa for pot, patio and garden use. plug/tray size : 405 – 600 Don’t choose a big plug, the younger transplanted, the better. But that’s only possible if the plug is enough rooted to transplant. growth regulation : Alar 64 ( daminozide ), provide sufficient spacing to avoid “stretching”. daylength reaction : after potting grow at Short Days (12 hours ) for 5 weeks to initiate flowering. The crop will be more compact, uniform and finish appr. 1-2 weeks earlier, compared to Long Day. The “First Flame” series is under development and has 4 colours available now. The way of growing is the same as the “Ice cream”‘ series. But these are bigger plants with a length of 14″to 18” and must be grown on bigger pots or packs than “Ice cream”. More pictures of the “First Flame” series can be found on the pages “Celosia” and “News”. An additional new colour is coming soon. “First Flame” series are bred for strong impact. The huge habit (35 – 45 cm / 14″ – 18″ ) and excellent side branching plants in 4 strong colours with a large flowerhead, make it a convincing product that is very suitable for gardens and landscaping. “First Flame” is outstanding in strong stems with flower quality and has sales appeal as a finished product. The strong garden performance and heat tolerance are a solid guarantee for a long season of full colour. 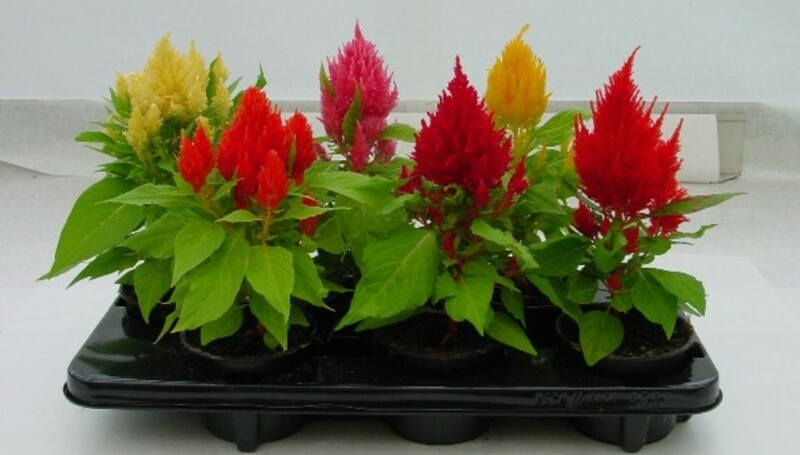 “First Flame” is the huge Celosia plumosa for pot, patio and garden use. daylength reaction : after potting grow at Short Days (12 hours ) for 5 weeks to initiate flowering. The crop will be more less tall, uniform and finish appr. 1-2 weeks earlier, compared to Long Day. We do more than just creating nice cut flowers and pot/bedding plants ! Hence these stories about research. 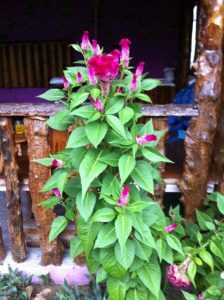 From contacts that we had with the Worldwatch Institute in Washington – USA ( NGO ) we’ve learned that Celosia is an excellent crop to fight the parasite weed “Striga” (witches weed) in tropical countries. That weed produces dust – fine seeds, it’s said to be about 50.000 seeds from 1 plant ! And spreads these with the wind, with close, agricultural machines and more, That causes for billions of damage in ( mostly ) the African agriculture. But the weed is occasionally also found in other tropical parts of the world ( see further ). It can infect the bottom for 10 years and kill important food crops like sorghum, wheat, sugarcane and corn. The small seeds of the devastating weed can remain dormant for a long time in the soil until a crop is sown or planted which is suitable for the parasite to germinate on it’s roots. Finally the weed flowers under the dying crop, direct above the soil with tiny pink flowers and then spreads enormous amounts of seeds. This leads to hunger and urbanisation, because people leave the rural areas and move to the cities, where they find poverty. **Note : Extended information and pictures about the dangerous weed “Striga” can be found on Wikipedia. In that article Celosia is mentioned as the “Striga chaser”, in the item about “trap cropping”. But ! Somehow Celosia can “clean up” the infected bottom and – according Worldwatch – scientifical research is done to find out why exactly. It seems that Celosia – when forming roots – works as some kind of trap by encouraging Striga to germinate in the soil. But then the Celosia defence doesn’t give the parasite a chance to invade and further develop on it’s roots, whereby the Striga germs die young by the Celosia blockade. In Uganda research has made clear that growing Celosia only one time on a heavily “Striga contaminated ” field reduces the amount of damage of Striga in the next crop already with 40 to 50 %. * Now they’re going to try out if “spread out sowing” a lot of Celosia on a field before starting to grow another crop can distract the Striga. And then after a few weeks the field is – hopefully – clean enough to make the soil ready for that other crop to be sown or planted. An extra advantage is that the grown Celosia plants can at the same time be used as a vegetable, eaten raw ( the leafs ) or cooked ( the leafs and the stems e.g. in soup ). In West and Mid Africa, from Senegal to the Congo, the crop is very popular and is called “Spinach of Lagos”. We,ve supported the ( American NGO ) Worldwatch Institute – help program called “Nourishing the world” for the poor countries with our expertise about technical growing instructions and other relevant information. Unfortunately we’ve lost contact with the Worldwatch institute. For some reason they didn’t respond anymore and we only received newsletters from them with non – relevant information. So we also didn’t hear anymore what the results of the scientifical research were, if there are any btw. But in the mean time we’ve gathered more information about this subject. After being known as an African problem, the weed appears also to have invaded North and South Carolina in the USA and Australia, threatening important agricultural crops. And – so we’ve heard – the American authorities have placed the weed on a quarantine list to avoid more spreading out. And that means that infected land can be unusable for 10 years or needs to be treated with chemicals (or so) to kill the sleeping ( dormant ) seeds. We don’t know yet if “solarisation” might effectively work to solve the problem, the seeds of the weed do resist heat and dry circumstances. In 2014 – 2015 we were involved in a research project – supported by the Dutch government – with some bio science companies, a high school and a Dutch university in Leiden – Holland to establish more about the contents and genetics of Celosia. The idea was to find out if Celosia contains useful ingredients for medicines, cosmetics, food extracts or whatever purpose, other than decorative. For that we’ve collected material of Celosia from our large “genes pool” and tried to make a mix with a wide spread variety of genetics. 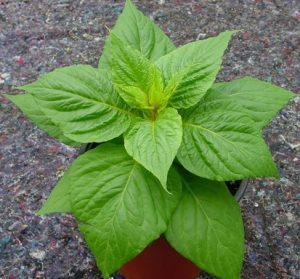 We’ve used information from the past about Celosia DNA and chromosomes, that was figured out for us by a Belgian university lab, to create that mix. 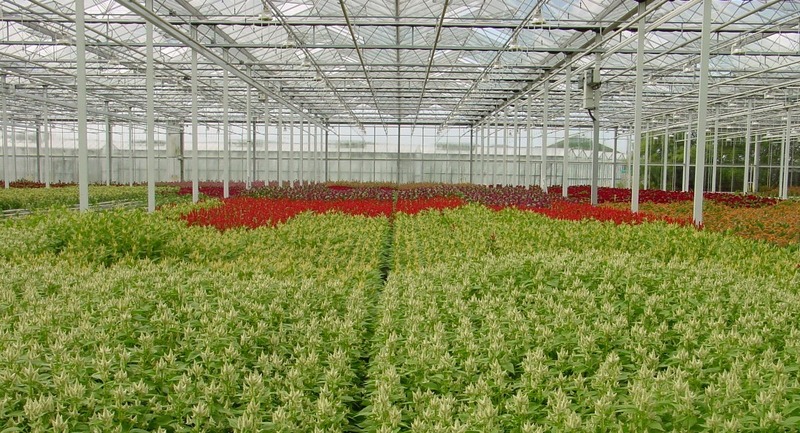 **Another goal of joining the research project was to see if Celosia could be a vegetable crop in Dutch greenhouse production, but energy costs seem to become a problem in our average climate with a crop like Celosia that needs much warmth and full sun. We’ve used 9 breeding lines / varieties to create what we call “the KCP mix”, 3 x cristata, 3 x spicata and 3 x plumosa. **And KCP is a Dutch abbreviation for the group of companies, university and high schools involved in the project. We also know that Celosia sown out in tropical areas of the world can become invasive in the wild, once they get the chance to form and spread out seeds. We’ve heard e.g. that this has happened sometimes in the Amazone area in Equador and western Brazil, where they don’t eat the plant. Like mentioned above, in Africa they simply handle that by eating the crop. On the other hand, we should not exaggerate this problem. Celosia is a common wild plant in all subtropical areas, eaten by animals as well. We have solutions to avoid ( or solve ) that invasion issue. E.g. we have the expertise about dormancy in Celosia and when seeds are ripen enough to fall. That differs according to the type of flower (cristata / spicata / plumose – see the assortment page) and even within the same type between varieties. If you know that, you also know how to get rid of seeds and unwanted young plants on the field before sowing or planting another crop. How to do that is our classified expertise. As you can read, a lot is already known to us. And seeds are in store of the KCP varieties mix (and more material, if needed). So feel free to contacts us, if you ever get faced with a Striga infection. We can be of help by the set up of trials to figure out which Celosia varieties are most effective in fighting Striga. And also if the crop can be used as food for humans or – at least – cattle or so. If they eat it in Africa, why not ! More information in the chapter below. For many years we ( Celex ) are breeding Celosia ( cockscombs / plumes / spikes ) for decoration purposes. But through the years we have build up a lot of material in stock that isn’t ( e.g. ) rich flowering enough and which might be useful to grow as an edible plant. – It’s grown and eaten in West and Central Africa, in a large area that stretches out from Ghana to the Congo. And also in the area around India / South East Asia. In Nigeria it’s famous and called “Spinach of Lagos”. In the Congo the leafs are eaten cooked and the stems cut to small pieces and used as a healthy filler in soup. In Indonesia it’s leafs are eaten raw ( like Amaranthus , belonging to the same plant family ). – We’ve tried some plants ourselves, the ( raw ) young leafs aren’t bitter and taste a bit like lettuce. – In the past the Dutch agri – university of Wageningen has given some help to Benin in West Africa to improve the local grown Celosia varieties for feeding purposes. This was about the varieties “Avounvo rouge and Avounvo vert” ( Benin is former Dahomey and French speaking ). – In Italy a project has been carried out to create an overview of what Celosia species are available for food production worldwide. The data contain consumption levels, nutritional values and a key to identifying edible species. This was done by the “International board for plant genetic resources” in Rome. – In Asia we’ve learned that the crunchy ( black ) seeds can also be eaten. It’s for instance nice stuff to decorate a bread on top. But the seeds aren’t really tasty ( we’ve tried them ) and in Vietnam the seeds of wild Celosia are called “chicken seeds”. Though Asians eat nearly everything, people don’t seem to like the tasteless seeds. – Some Chinese use the flowers of Celosia cristata to make egg drops soup (first boil Celosia flowers in water to create colour and then stir eggs and other ingredients into the soup), others use sliced Celosia flowers to pan fry with meats. Other receipts can even be including Celosia seeds in rice cakes, Celosia fish soup, pan fry young shoot of Celosia (such as cabbage). * BTW : Celosia cristata flowers are used in Chinese medicine to stop bleeding, Celosia seeds extracts are used to improve sight and eyes related diseases in the Philippines. Always eager to learn more…….. The plants world still has a lot of undiscovered possibilities ! Peter van den Bosch – breeding manager of Celex.